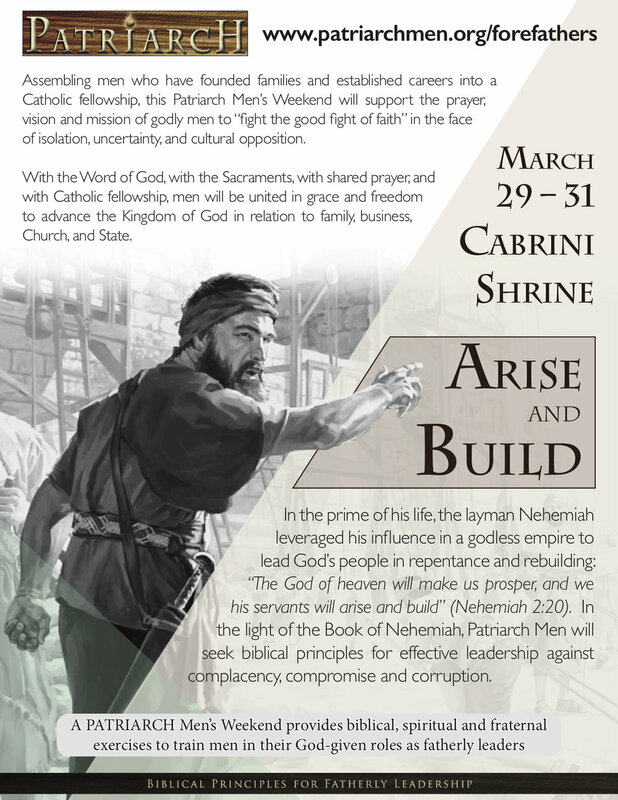 Assembling men who have founded families and established careers into a Catholic fellowship, this Patriarch Men’s Weekend will support the prayer, vision and mission of godly men to “fight the good fight of faith” in the face of isolation, uncertainty, and cultural opposition. In the prime of his life, the layman Nehemiah leveraged his influence in a godless empire to lead God’s people in repentance and rebuilding. In the light of the Book of Nehemiah, Patriarch Men will seek biblical principles for effective leadership against complacency, compromise and corruption. $255. This covers your private room, all meals and retreat activities. Please note: The gate closes at 5:45pm and dinner will be served at 6pm. Please plan on arriving between 5-6pm. All individuals will be given the gate code prior to the retreat. Cost for the weekend is $255. This covers your private room, all meals and retreat activities. You may securely pay online via paypal. You do not need a paypal account to pay online, all you need is a credit/debit card. Please plan on arriving to the Mother Cabrini Shrine in Golden between 5-6 pm. Dinner will be served in the main building at 6pm. The gate closes at 5:45pm and you will be given the code to enter after 5:45pm, but please note on your registration if you will be arriving after 5:45pm. Please bring a Bible and journal. You will need to bring a towel. Blankets and pillows are provided by the retreat center. High temperatures that time of year are typically in the mid 50s and low temperature should be in the low 30s, so please pack accordingly. There will be extended time on Saturday for outdoor recreation/hiking if you are interested. Meals will be provided from dinner on Friday through Breakfast on Sunday. Retreat activities will conclude no later than noon on Sunday. We will be celebrating Mass on Sunday morning.